COME - Collection of Modern Eyewear - will be held again this year. This event features popular eyewear brands from Japan and overseas. The contents and scale of COME 2019 surpass that of the previous year. You are warmly invited to come and view and touch the actual products at the event, and join us in appreciating the new potential of the eyewear business. We look forward to seeing you at the event. *Visitors may enter the exhibition areas throughout the duration of the event without making any appointments. 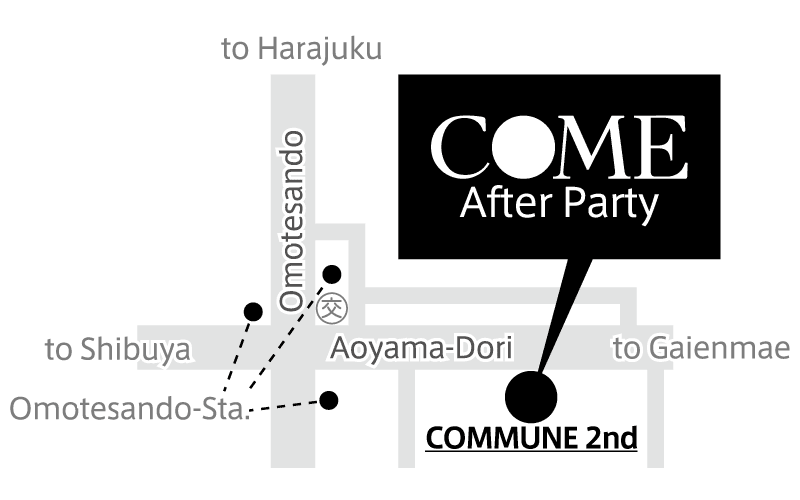 A post-event party for COME will be held on 10 April (Wed.), 19:30 – 21:30 during the exhibition period. Interested parties from participating brands will come together under one roof, and drinks and a light meal will be provided. We look forward to your attendance. The party is an opportunity for new encounters and friendly conversations with the participating brands, so do feel free to drop by. ■We provide support for inquiries, requests, and business negotiation needs. Please submit any inquiries you may have about the contents, venue, participating companies, or other questions about the event. The organizer will also respond to requests to participating exhibitors and business negotiation needs, so please feel free to contact us if you have any requests. You may also approach the reception staff during the event itself. *The respective exhibitors will decide whether or not to accept business negotiation requests. Hence, we do not guarantee that such requests will be accepted. The organizer is only responsible for liaising with exhibitors. To submit requests, please contact the COME Executive Committee.